In today’s political and regulatory climate, the insurance industry is experiencing unprecedented change. Lisa Miller & Associates leads the pack in keeping on top of these developments, interpreting how they will affect our clients, and helping them adopt changes in their business plans. More importantly, we are on the ground in Tallahassee and in districts statewide working with local, state, and federal officials, lawmakers, and regulators advocating for our companies and their policyholders’ interests in shaping insurance regulation. In 2017, LMA continues its leadership role as the lead consulting firm to encourage a true private flood insurance market in Florida. The National Flood Insurance Program (NFIP) is a nearly 50 year-old federal monopoly that is collapsing under its own weight of $24 billion in debt, inefficient bureaucracy, and outdated data and modeling techniques and that is a costly disservice to property owners and U.S. taxpayers. Teaming with an influential Tampa Bay area state senator, LMA helped develop and implement an ongoing comprehensive policy and regulatory framework (through SB 542 and SB 1094) to encourage private firms to write flood insurance in Florida as an alternative to NFIP’s rising premiums. This framework, the first of its kind in the country, is giving Florida consumers real choice. As a former Deputy Insurance Commissioner, Lisa consults for insurance companies of all types including those that write personal and commercial lines as well as life and health insurance organizations. In the property and casualty insurance arena, Lisa Miller & Associates represents almost 15% of Florida’s six million property insurance policies and works diligently to drive sound insurance public policy, assisting her clients with keeping their promises to their policyholders. 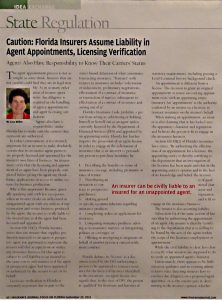 She served as lead advisor to Florida’s Property and Casualty Insurance Fraud Task Force and many other insurance boards and advisory organizations. In addition, she serves as regulatory consultant to investors who are entering Florida’s insurance market, helping them navigate the regulatory environment and understand the Florida insurance market opportunities. Lisa also is recognized as a subject matter expert for Florida’s Property Assessed Clean Energy (PACE) program that allows city and county property owners to reduce premiums by strengthening their properties against the wind and reducing electricity costs by improving a structure’s energy efficiency. 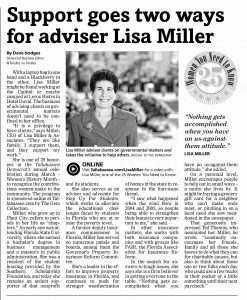 Lisa was on the negotiation team that landed $2 billion in funds to finance the Florida PACE Funding Agency’s program. Lisa is the exclusive insurance lobbyist and technical consultant for the Florida Realtors, statewide trade association, where she has worked with Citizens Property Insurance Corporation in streamlining its sinkhole insurance coverage offerings in order to improve property values and real estate transactions in Florida’s sinkhole alley. One of the consequences of the Great Recession was that Citizens Insurance transformed from the “insurer of last resort” to the largest property insurer in Florida – a role never intended by its original legislative creation or mandate. 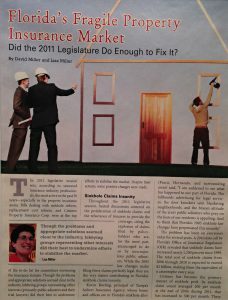 LMA, in discussion with key private clients, helped create and fight hard for the eventual solution (HB 1127) in the 2012 legislative session, which made storm assessments fairer and removed a major barrier to market entry into Florida by private insurers. This success was followed in the 2013 session by further assessment reductions in the Florida Insurance Guaranty Association. LMA led the team to revise how FIGA funds an insurer insolvency. This first-of-its-kind-in-the-country legislation changed the way guaranty associations garner financial resources to pay claims. Lisa Miller & Associates has sophisticated knowledge in the P&C markets and maintains relationships with the Office of Insurance Regulation, Office of Financial Regulation, and Florida Department of Financial Services.